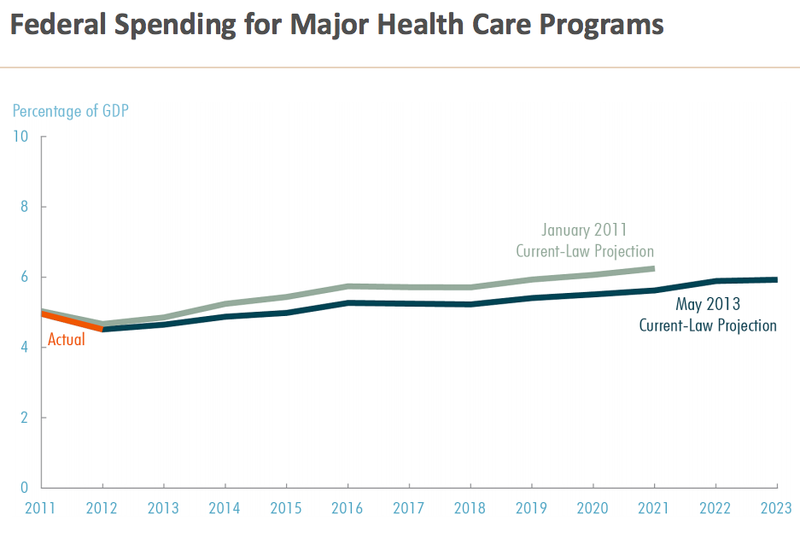 Consider the CBO's opening chart this year, which appears at the top of this article. Stare deeply into its green and darker green hues. 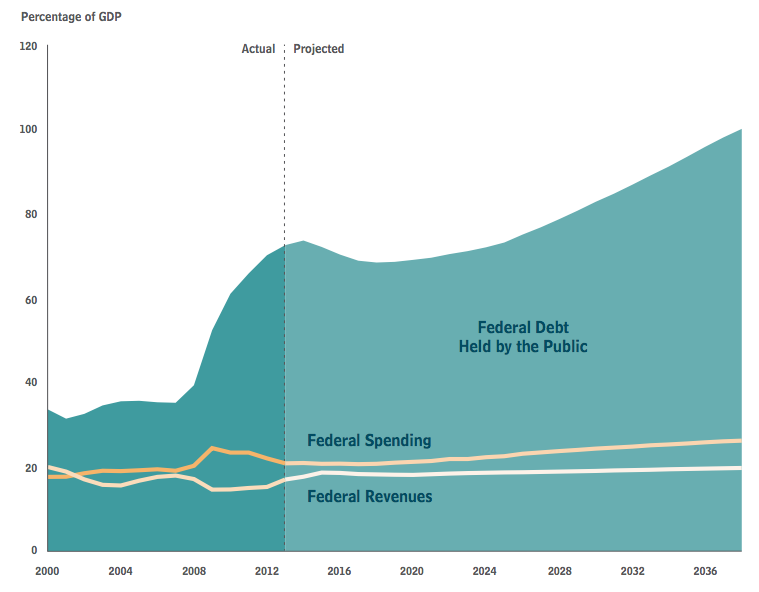 Squint and meticulously trace the federal spending and revenues lines. What do you see? Fiscal conservative Jim Pethokoukis sees the case for fiscal conservatism. Don't-worry-about-the-debt economist Brad DeLong finds cause to not worry about the debt. I think Brad is right for now and Jim less right, but who cares what I think? After writing about this stuff for a few years, it occurs to me that I will never change readers' mind about the debt. Ever. 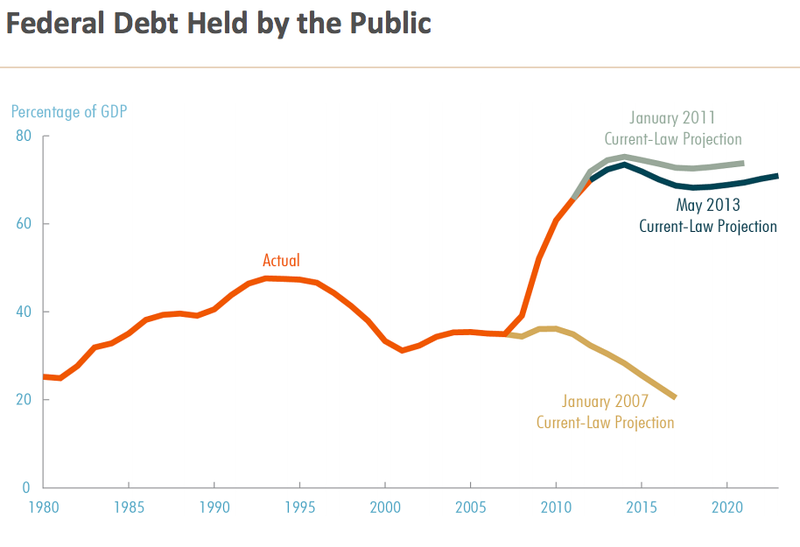 If you locked a hundred budget wonks in a room with one simple debt graph and told them they couldn't leave until they agreed on what it meant, cannibalism would come before consensus. ... 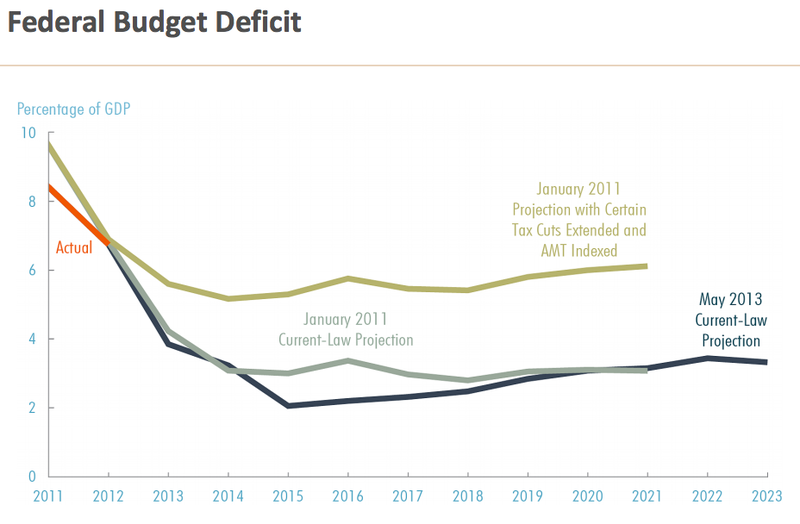 Without warning, health care costs slowed down and Congress repeatedly flayed the discretionary budget for dubious reasons, and CBO's debt projections fell, by many trillions of dollars, once again (see: BLUE). Of particular note, projected spending on Medicare -- perhaps the most important driver of our long-long term debt -- fell sharply since the recession, but not because of the recession. "Evidence does not support a finding that demand for health care by Medicare beneficiaries was measurably diminished by the financial turmoil," Michael Levine and Melinda Buntin wrote in a CBO working paper this spring, and "much of the slowdown in spending growth appears to have been caused by other factors." Since you made it this far, here's my unyielding argument: In the middle of a crisis we knew we were having, we've sacrificed growth and jobs to insure ourselves against a crisis we thought we'd have in the future -- whose imminent threat is fading by the year. The tired cliche says, Washington is miserable at thinking about the future. One sequestration, a thousand cuts, and many trillions of dollars of deficit reduction later, perhaps that cliche could lose its last three words.